We all have noticed at least once in our lives that the gap between the rich and the poor is constantly increasing and we do not see even a bleak chance that this gap will ever lessen. 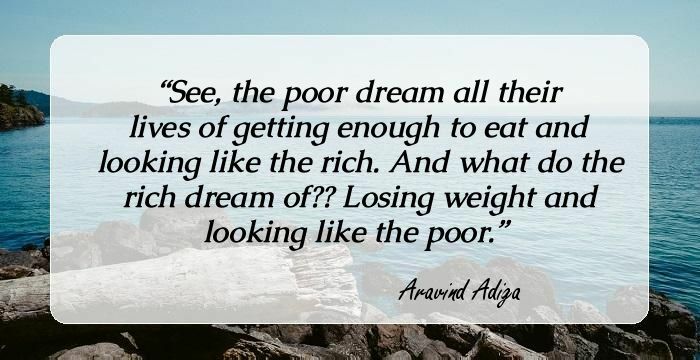 Aravind Adiga who has gifted the world with ‘The White Tiger’ has talked about this stark difference between the growing economy of India and the poor in a very articulate manner. This was the first novel from his literary treasure and it has earned him the Man Booker Prize award in 2008. Within a year, his second book ‘Between the Assassinations’ was published and when asked about why and how he published two novels back-to-back, he answered that these two books are actually interlinked, and even the stories have developed from one another. Between the Assassinations, talks about the political unrest which was prevalent in India in between 1984-91, the years when Prime Minister Indira Gandhi was assassinated, followed by the assassination of her son and successor Rahul Gandhi. Adiga has vivid memories of those times and recounting the day when Indira Gandhi was killed, he says that all schools were shut. That was the first time his father had gone to his school to pick him, in order to make sure that he reaches home safely. He was around 10 years old at that time and this imprint of the day and the events which followed, led him to write this book. This also shaped his views which are reflected in his quotes. Read on to enrich your thinking. Let animals live like animals let humans live like humans. That's my whole philosophy in a sentence. If only a man could spit his past out so easily. You can't expect a man in a dung heap to smell sweet. A man's past keeps growing, even when his future has come to a full stop. Inconvenience in progress, work is regretted. In a socialistic economy, the small businessman has to be a thief to prosper. The Rooster Coop was doing its work. Servants have to keep other servants from becoming innovators, experimenters or entrepreneurs. The coop is guarded from the inside. But without a family, a man is nothing. When it comes to work - hurry, hurry, hurry. When it comes to payment - delay, delay, delay. Caste, religion, family background nothing. Talent everything. Who would have thought, Mr. Jiabao, that of this whole family, the lady with the short skirt would be the one with a conscience? It's true that all these gods seem to do awfully little work - much like our politicians - and yet keep winning re-election to their golden thrones in heaven year after year. But I complain about the police the way the rich complain not the way the poor complain. The difference is everything. 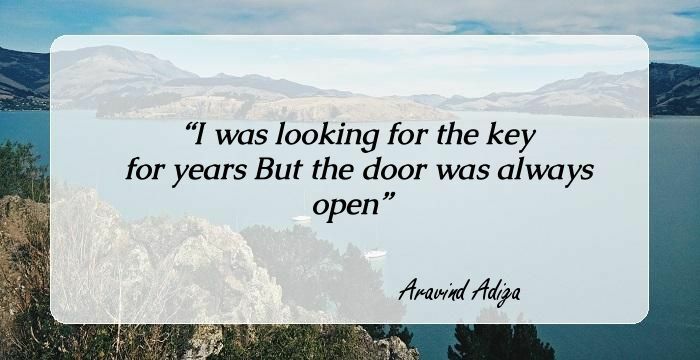 You were looking for the key for years, but the door was always open. Sardonic, seriocomic saga of the plight of India's poor. I am a self-taught entrepreneur. Thats the best kind there is, trust me. I was never born and I will never die I do not hurt and cannot be hurt I am invincible, immortal, indestructible.